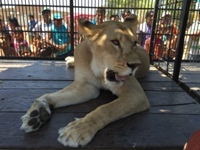 On March 12, 2015, the Peruvian authorities, SERFOR and ATFFS with ADI raided a circus in a desert area of northern Peru saving three lionesses and two monkeys. 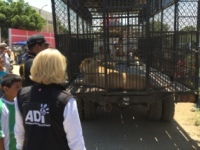 ADI has now rescued almost 70 animals during Operation Spirit of Freedom and urgently needs funds for the massive relocation operation of all of these animals. Three lionesses and two monkeys have been saved. The dramatic seizure confirms that ADI and the animal protection groups we are working with in Peru have remained vigilant in enforcing Peru’s ban on wild animals. Following a tip off ADI has been trailing the circus for over a week whilst negotiating the confiscation of the animals with the authorities. This has meant another major seizure operation in the middle of an already large complex mission.